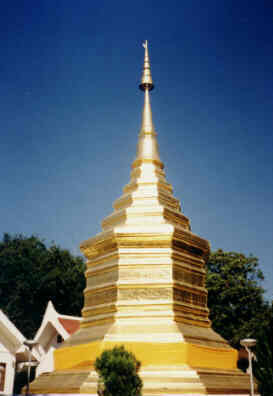 Photo: Chedi of Wat Phrathat Chom Thong, Chiang Rai. "For more elegantly presented data on northern Thailand and Laos, don't miss Thailand online, which is particularly strong on the tiny town of Pai, a trekkers' favorite, as well as Chiang Rai in the Golden Triangle area. This site also contains a link to White Lotus Press which specializes in books about Thailand and Southeast Asia." Makha Bucha Day, Songkran Festival (Water Festival), Visakha Bucha Day, Loi Krathong Festival (Photos, Photos, Photos ...). Siam Sun Tours Ltd. Part. Thailand online received the BizCardz Business Directory QUALITY SITE AWARD. Thailand online has been chosen from 33,000+ other sites listed in the BizCardz Business directory to be highlighted on our special Quality Site Award category. Congratulations! Thank you for visiting Thailand online, which is one of the largest databases about northern Thailand! Please come back again! Don't forget to bookmark Thailand online! And visit also the guestbook of Thailand online! Books about the following Asian areas and subjects: New and out-of-print books and also old maps and prints (16th to 19th century): Burma, Vietnam, Yunnan, Cambodia, Thailand, Laos, Malaysia, Indonesia, China, India, Northeast India, Central Asia (defined as areas along the silk routes), Himalayas; Natural History: Flora and Fauna, Ecology, Performing Arts, Textiles, Religion and Philosophy, Ceramics, Linguistics. Thailand Books: White Lotus Press Bangkok. Search for Books, Guide Books, CD-Roms and Videos about Thailand, Laos, Burma, Vietnam, Cambodia, Malaysia, Indonesia, China, Yunnan, India, Northeast India and Southeast Asia: Click here! This page was created on October 6, 1996 and last updated on July 23, 2005. Diese Seite wurde am 6. Oktober 1996 gestaltet und zuletzt am 23. Juli 2005 aktualisiert.